It was my very close friend’s birthday and she made me chief organizer. As a side note, I must be great at organizing events and should probably start charging folks starting… Anyway, my main job was to get a cake and small chops for the celebration. I really wanted my friend’s birthday party to be amazing and didn’t want the regular cakes everyone in school gets (Cakes and Cream and Tlash) so I decided to try a different confectionary. Sweet City is located at the food court section of Adeniran Ogunsanya Mall, and is directly opposite Coldstone. The smell of cake and butter will constantly pull you towards their stand! I’ve had delicious cake slices from Sweet City in the past so I was sure of the quality of cake I’d be getting. Plus, the cake prices at Sweet City are pretty affordable. 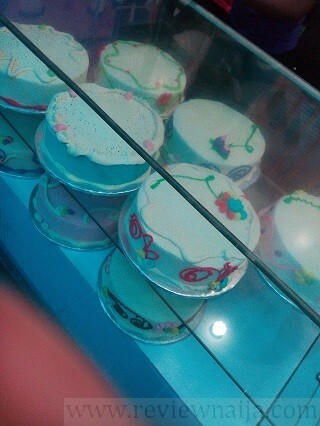 Cake slices cost 150 naira/slice while the ready-made cakes cost 3,600 naira each. Cake orders usually start from 5,000 naira. 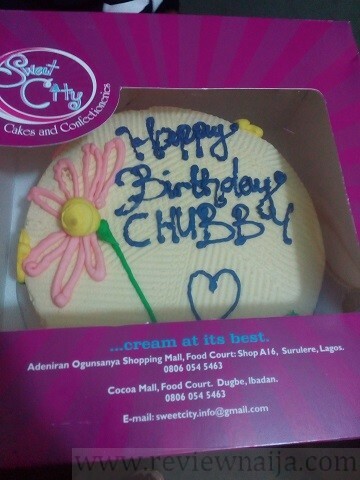 I selected one of the ready-made cakes and the Sweet City team was able to add a message within a few minutes! I had to pay with cash though as there was no POS available. My cake was beautifully packaged and off I went! First, let me mention that my friend’s birthday was a hit. The cake was delicious and everyone was really surprised as it was quite different from the norm. I was glad that I made my friend happy and her day was special. I will rate Sweet City a 7 over 10. In these modern times I can’t seem to think of any reason why a proper business doesn’t have POS machines.